One hundred years ago the community of Swan River worked together to raise $5,000.00 at $10.00 per share to start the first two sheet curling rink on the corner of 6th Ave. N. and Verteran’s Way. The second three sheet rink, combined with a hockey rink, was located east of the present Seniors Centre on 7th Avenue N.
The third rink(6 sheets) was built at the present site. This rink was destroyed by fire the same year. The fourth rink (8 sheets) was located on the same location. It was at this time the Agricultural Society donated the land to the curling club for $1.00. This was a wood structure which was condemned in the late 1980′s. The present six sheet steel structure was built in 1992 and exists today. The minutes revealed how tightly bonded the curling club was involved with the Agricultural Society. It was interesting to read that prior to the start of the rodeo, the men’s curling club organized July 1st celebration for many years. Horse racing, baseball tournaments and meals were provided for $1.25/plate. 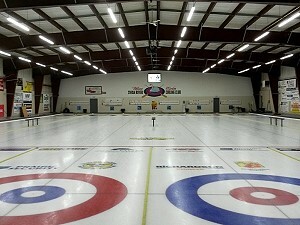 The Swan River Community Centre (Curling Club) is one of the finest curling facilities and offers enjoyment to all. The Swan River Men’s Centennial Bonspiel is being held Mar. 9-12th. We invite you to come to the rink and join us in celebrating this special event.